Well, they weren’t kidding when the Barton 1792 distillery came out with their High Rye release of their iconic 1792 Bourbon. A hefty bourbon at 94.3 Proof. The nose just wacks you with rye. It has a lovely corn syrupy mouthfeel that reminds me of E.H. Taylor bourbons but the taste is all Rye. This is probably only barely bourbon with about the least amount of corn you could have in a mashbill. The corn merely serves as background for the Rye. It’s very interesting. I have always found Rye whiskies to be a little bit thinner in the mouthfeel than bourbon, and thus I think I prefer bourbon generally. But this is a nice thick rye flavored whiskey. Darn good. At this point, I have tried all the 1792 variants except for the port finish which I have been unable to find. Here are my recommendations as far as my favorites in the 1792 line. 1. 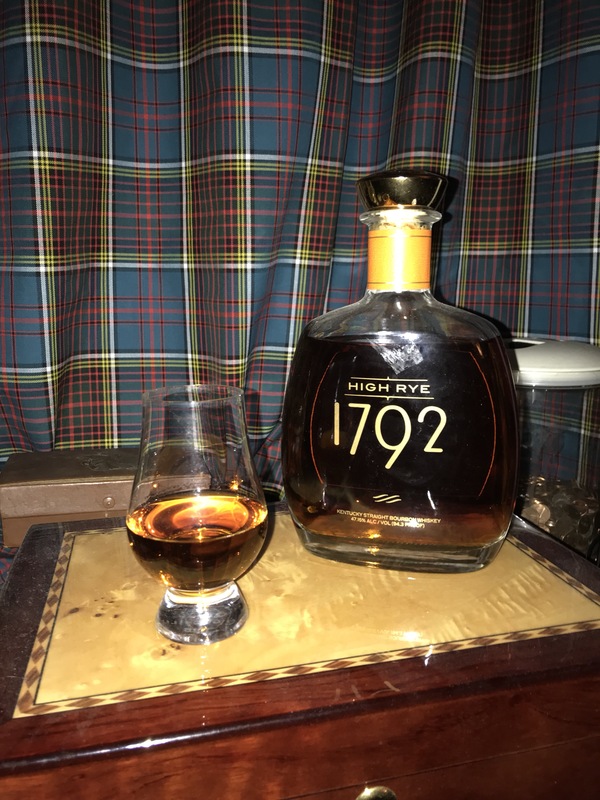 1792 Single Barrel-a truly lovely top shelf bourbon. Spicy yet sweet Amish cookies in a bottle. A great cigar or desert bourbon. I wish I had access to this all the time. 2. 1792 Full Proof. Not quite Cask Strength at 125 Proof. It’s proofed down to its initial proof. Great whiskey but it’s like a little too much raisin on the finish? I prefer Stagg Jr. as a cask strength in the same price range but this is an amazing full strength bourbon. 4. 1792 Small Batch. A great everyday sipper in a real cool bottle. 5. 1792 Sweet Wheat. I recently reviewed this. It’s good but it has that Bardstown wheated bourbon funk to it; not as bad as the Heaven Hill ones with the Beam family yeast, but still. In emails from Chuck Cowdery he questioned whether I even like wheat recipe bourbon based on my disdain for Larceny and Old Fitzgerald. Except I just love Weller and Pappy, with William LaRue Weller being my all time favorite bourbon. So I am always trying other wheat recipe bourbons, but I don’t understand what sabotages certain ones for me. Maybe it is high barley and wheat that just doesn’t work for me on this one, as it doesn’t have the Jim Beam peanut funk on the end. Weller is in such short supply due to high demand, but I can’t seem to find a substitute.